Recommended by our good friend Tom Hammerlund, this set of Google Sheets templates should be part of your teaching arsenal. Use pre-made Google Sheets to quickly create a random name picker, jeopardy games, word puzzles, crossword puzzles, and more. Copy one of the Google spreadsheet templates provided on the Flippity website. Replace the default information with your own. Share the Flippity link provided on the spreadsheet tab called Get the Link Here. Voila! Now let’s have a look at the types of activities you can create. This is definitely one of my favorites. Grab your class list and paste it in the Google Sheets template available at this link. In a few steps, you will create an online random name picker in the shape of a colorful spinning wheel. Click the wheel, watch it spin and pick a random name from the list you fed it. The online random name picker also features options to pick a line up, create random groups of 2, 3, 4 of 5 and even to build teams or seating charts. Once you created your class list and generated the link to choose random names out of a hat, you should bookmark the URL so you can come back to it as often as needed. But wait, there are a lot more templates to explore! 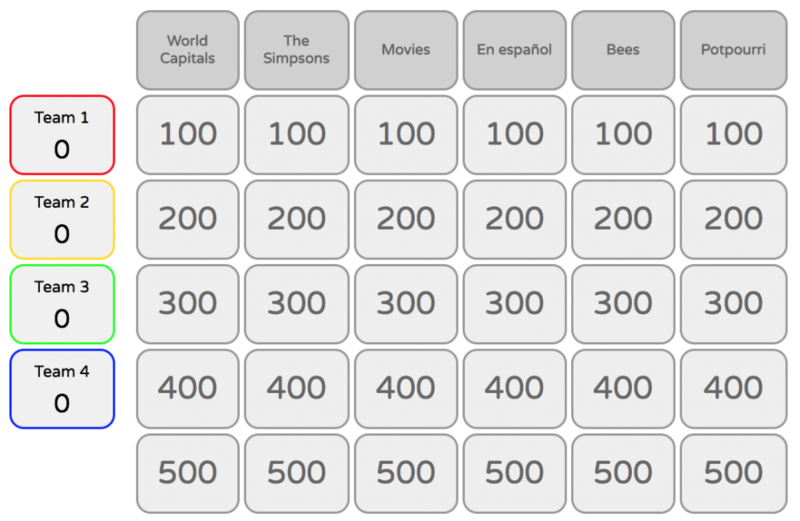 In the past, you may have used old PowerPoint presentations to create Jeopardy games. You can now easily turn a Google spreadsheet into a trivia game show. Bring your questions and answers, and all the interactions are created for you. Don’t sweat it, just try it: make your own online Jeopardy game. In a similar fashion, you can create memory games which may be more appropriate in elementary classrooms. I highly recommend trying out Jeopardy games and memory games if you have an interactive whiteboard. The students will love it. The list continues on and we won’t detail all the options available to you but from their website, you can also create a quiz with certificate, sport team brackets, mix and match, progress indicators, madlibs, badges and even flash cards. Go check it out, you won’t regret it. Thank you Jenny! I am so glad you think so too. There are lots of great tricks to use with this. How can I help you? Did you not understand the app? Did you try it? At which step are you stuck? Let me know and I’ll do my best to walk you through it.